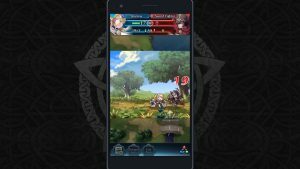 Fire Emblem Heroes is a turn-based strategy RPG just like the other mainline games in the series. 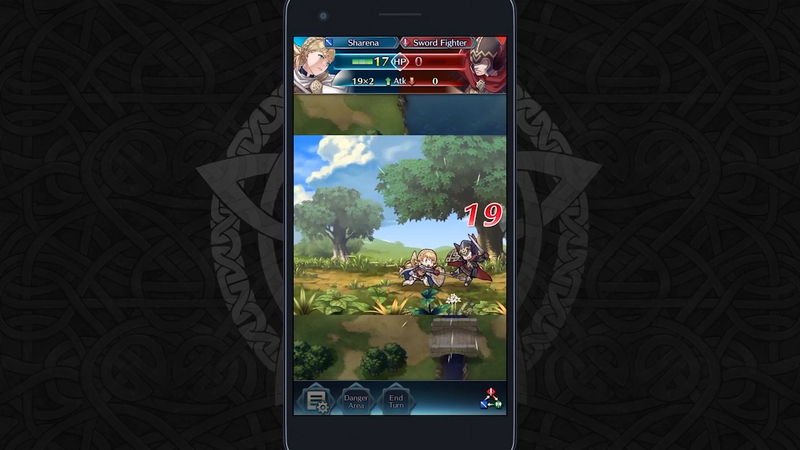 During battles, you and the computer each take turns to move all of your available units on the map. Victory is achieved after one side manages to defeat all of the opposing units. 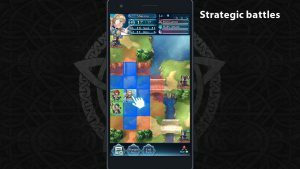 In Heroes, maps are always 6 x 8 squares in size, which is much smaller than in other Fire Emblem games. As a result, the movement ranges for units has been drastically reduced to compensate. 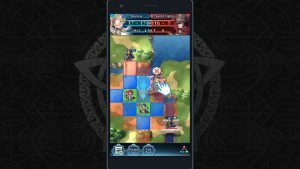 As always, you control the blue units, while your opponent controls the red units. 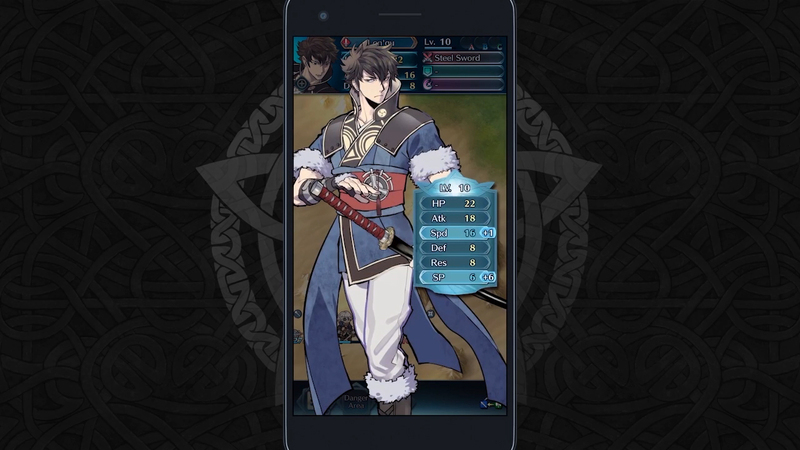 If you’re unsure of a unit’s allegiance, look at the colour of the HP number and gauge directly below them. 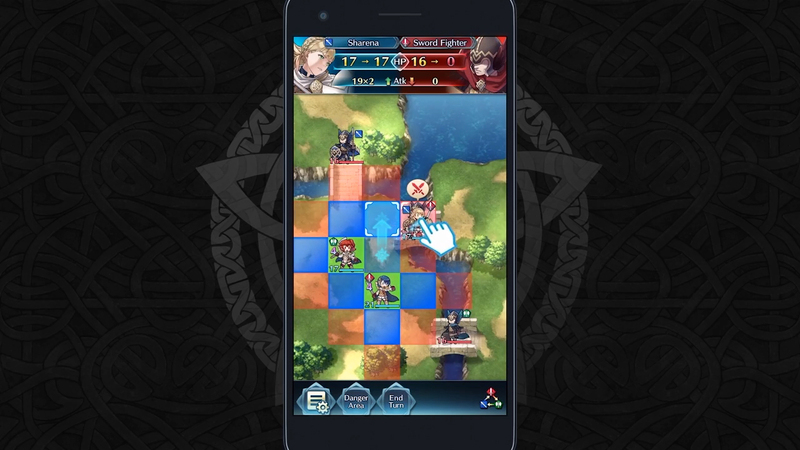 After selecting one of your active units, the unit’s movement range will be displayed as blue squares and the unit’s maximum attack range will be displayed as red squares. Movement Range: This depends on the unit and the terrain in their path. Most units have a movement range of 2 squares, but armoured units only move 1 square at a time, while horseback units (not flying units) can move up to 3 squares. From here, you can select one of the blue squares to move your unit to that location. After moving a unit, if there’s an enemy unit within attack range, you can select the enemy unit to attack him or her. Alternatively, if an enemy unit lies within a red square, you may select that enemy unit to begin with. Doing so will make your unit automatically move to the nearest available position from where they can attack the enemy unit. Attack Range: This depends on the unit’s weapon. Close-range weapons can be used on adjacent squares only (excludes diagonal squares), while ranged weapons require a separation of 1 square. Your unit will inflict damage on the enemy. If the enemy survives, they will retaliate with a counter attack. If both units survive, the faster unit may perform a follow up attack. Note: Events 2 and 3 will not occur for the enemy if their attack range is not compatible. For example, if your unit has a close-range weapon and your foe has a ranged weapon. HP: Hit Points. This is reduced after sustaining damage. After it reaches 0, the unit is incapacitated. Attack: Attack rating. This determines the damage done to the opposing unit. Number of Attacks: Indicated by the (x2). 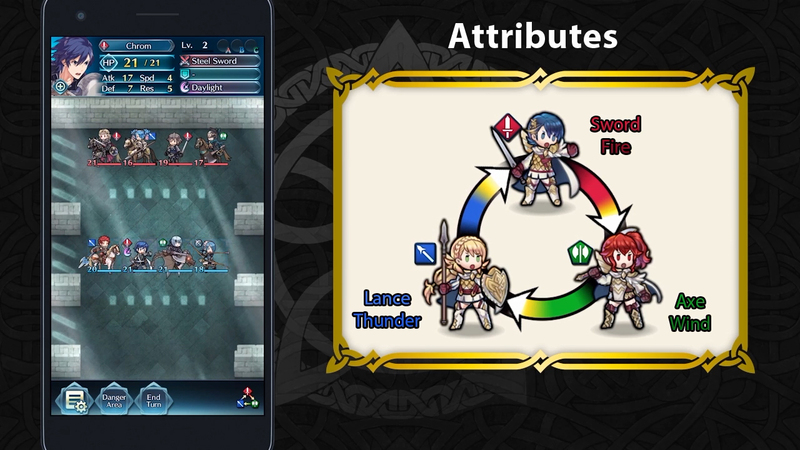 This means the unit can trigger a follow up attack. Weapon (dis)advantage: Indicated by the arrow pointing up or down. The colour triangle is thus: Red beats Green, Green beats Blue and Blue beats Red. 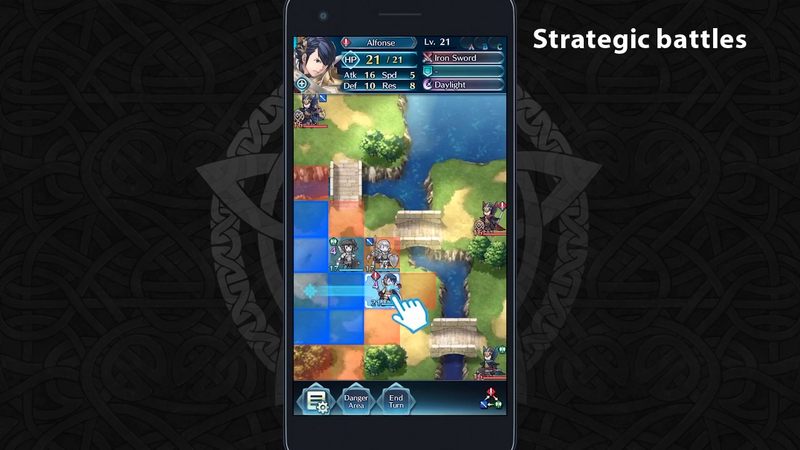 To make it easier to remember, the colour triangle appears in the bottom-right corner during battles. When a unit has an advantageous colour type, they will deal more damage and receive less damage to boot. Therefore it’s always a good idea to check the enemy’s colour type before attacking. After damaging or defeating an enemy, your unit will gain experience points. Once they have earned enough experience points, they will Level Up and improve their stats and occasionally gain access to new skills. Unlocking Potential: By continuing to Level Up your units, you can even increase their Rarity, which can grant them better stats, weapons and skills. Anyway, after moving or attacking with your unit, that unit’s icon will turn grey, which means it has finished moving for that turn. Once all of your units have finished moving, your turn is over and your opponent’s turn begins. During your opponent’s turn, all you can do is watch anxiously as your opponent moves their units. After your opponent has finished moving all of their units, it will be your turn again. This process will repeat until there’s a victor–hopefully you! 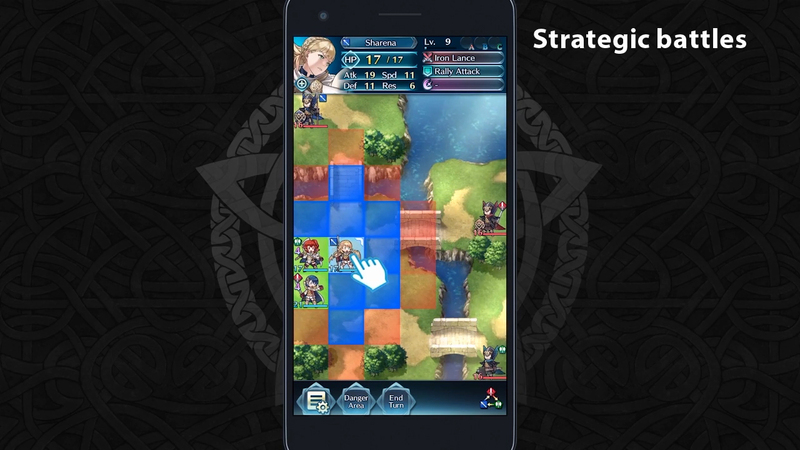 Non-Permanent Death: Heroes operates under a permanent “Casual Mode”, where units that reach 0 HP return after the end of each battle, instead of being gone forever like in earlier Fire Emblem games. However they will lose all experience earned.